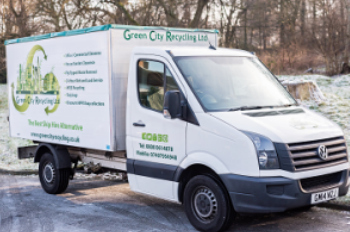 Green City Recycling Ltd is the best skip hire alternative, providing an efficient and environmentally conscious waste collection and disposal service. Why hire just a skip when you can have our friendly, professional and reliable team? We will remove all waste for you and dispose of it responsibly at a fraction of the cost and without the hassle a skip entails. Green City Recycling Ltd is a fully registered waste carrier with full insurance, covering London and the South East, including Surrey, Kent, Sussex and more. We operate 24 hours a day, 7 days a week, collecting anything from domestic or commercial clearances to builders’ trade waste. We are highly responsive and even have the capacity to offer a ‘book today, gone today’ service when required. No job is too big or too small, whether it’s an office clearance, demolition job or even just a few bulky items, we are here to cater for all your waste removal needs. As our name suggests we are conscious of the environment and pride ourselves on driving towards 100% recycling and landfill diversion. Some items are even donated to charity shops upon customer requests. Our prices are very competitive and include all labour and recycling fees, so there are no hidden costs. Our aim is to save you money! You leave all the hard work to us, and we will leave your property clean and tidy, allowing you to sit back and relax, stress free. We are fully insured for your peace of mind! Rest assured that Green City Recycling Ltd will provide a great service, hassle free for you, no skip permits, no worries! Whether it’s heavy lifting or reaching those awkward places that you can’t get to, we adapt to accommodate your individual needs.